Why did Abe offer apologies specifically to Americans, but not to Japan’s Asian neighbors? In a word: national interest. In the heart of Washington D.C., trees along Massachusetts Avenue, where Embassy of Japan is located, were decorated with three flags: the District of Columbia, the United States, and Japan. Anyone could literally see that Washington was prepared to welcome Japanese Prime Minister Shinzo Abe. 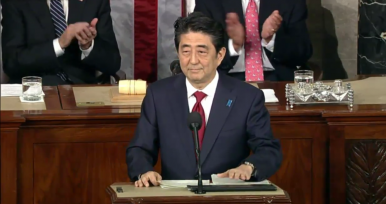 Numerous standing ovations during his speech before the U.S. Congress demonstrated how close the United States and Japan are each other. In addition to the celebration of friendship between the United States and Japan, another remarkable point of Abe’s visit came when he officially conveyed his “eternal condolences to the souls of all American people that were lost during World War II.” In contrast, during a speech in Harvard University, Abe chose not to acknowledge Japanese involvement in the sexual slavery of Asian women during the Pacific War. Why is Japan so two-faced? What makes Japan apologize to Americans but remains reluctant to admit its past wrongdoings despite constant demands from Asian countries? In a word — national interest. What does Japan gain from a robust alliance with the United States? Japan is expected to gain from building better relations with United States in two aspects: economy and defense. On the economic front, Japan is expected to gain from the Trans-Pacific Partnership (TPP). Japan’s GDP per capita is estimated to grow by 1.5 percent as TPP enhances Japanese trade volume and boosts foreign direct investment. Second, a good relationship with United States provides Japan with defense benefits. The recently revised U.S.-Japan Defense Guidelines allow Japan to play a more active military role hand-in-hand with the United States. The new defense guidelines give Japan more freedom of military action, which had been restricted by San Francisco Peace Treaty. Since the benefits from the alliance with United States outweigh the sentimental costs to Japanese people of conveying apologies for American casualties, Japan has no reason to hesitate in expressing condolences and delivering apologies to the Americans. In the same way, as long as the benefits of fixing relations with Asian countries do not outweigh the sentimental costs of conveying apologies, which would require the Japanese people’s acknowledgement of what their grandfathers have done wrong, Japan will have no reason to extend clear apologies. Currently, it seems that Japan chooses not to apologize and acknowledge sexual slavery and massacres during World War II because the benefits from Asian countries are not considered significant enough. According to the World Trade Organization (WTO), Japanese exports to China and the Republic of Korea account for approximately 25 percent of its total exports, but it could be considered negligible compared to the costs for the Japanese to admit what their grandfathers have done. It seems Japan is unlikely to apologize until Japan’s ties with Asian countries provide as many or more benefits than Japan gets from the U.S.-Japan alliance. Abe’s U.S. visit shows that national interests can induce official apologies from Japan for its past wrongdoings. Many Asian countries, China and the Republic of Korea in particular, are not satisfied with Japanese apologies for their military actions during World War II and demand a more wholehearted apology from Japan via official channels. Unfortunately, it is unlikely that the Japanese will admit to the shameful deeds of their ancestors unless they get something in return, such as economic and defense benefits. Therefore, there is a lesson that we can derive from U.S.-Japan relations. Appealing to sentiment has not been working, and it will not work in the future, but appealing to national interest will absolutely work. Asian countries should understand that emphasizing how useful and lucrative they could be to Japanese national interest, is the only way to gain official apologies from Japan. In the international arena, relationships are not about who is good and who is bad — it is all about give and take. David Eunpyoung Jee is a Korea Foundation Associate Researcher of the Asia-Pacific Security Program at the Center for a New American Security. He previously served as a military officer at the operation center of Republic of Korea Joint Chiefs of Staff. The Japan-South Korea Maritime Spat: Lessons Learned Japan's Foreign Policy Balancing ActChina, South Korea Not Convinced by Abe's WW2 Anniversary SpeechShould the United States Be Blamed for Japan’s Historical Revisionism? The Abe Statement: Did Abe Apologize?